Day 16. 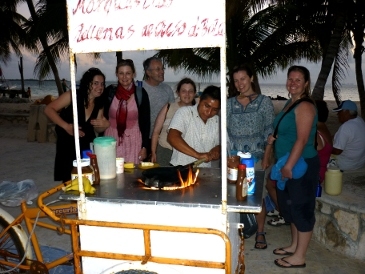 Didn’t we have a lovely time the day we went to the seaside (aka Isla Mujeres)! A short ferry ride to the island of Isla Mujeres, we secured our transport … one golf cart and four bicycles, all of which had the same top speed, except for one bike which actually worked, and whose rider (Val) was able to lap us four times over. After a circuit of the island and an hour or two swimming at beaches we didn’t have to pay $20 to get onto, we sat down to a meal of fresh fish and chips (actually, fish and tacos) on the seafront. Hurray…you finally got your fish and chips! News foryou … Liz and Richard in Egypt for a week. Have you weighed yourselves recently? Your wedding suit will soon fit you again, Safe. You’ll be able to get the photographs…at last!!! We’ve not had a chance to weigh ourselves but we’re looking to double our weight in the next three months. In the meantime, we’ve decided to use Safe’s wedding suit as a mosquito net in the tropics!